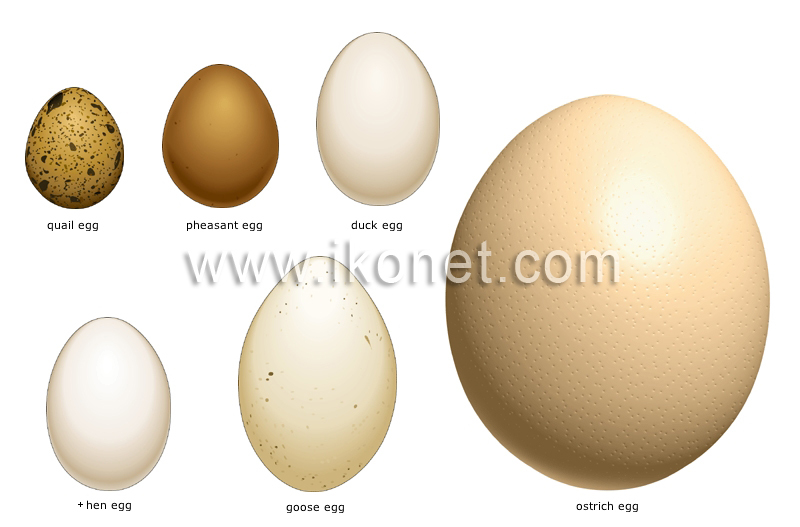 Foodstuff that female fowl, especially hens, produce by laying; there are many ways of preparing them: e.g., soft-boiled, scrambled and in omelettes. By far the most commonly eaten, it is cooked as is or added to recipes; used alone, the word "e&egg"e& refers to a hen’s egg. Rounder and smaller than a chicken egg, it is not readily available; it is mostly eaten hard-boiled, in salads or aspics. These relatively large eggs weigh between 250 and 300 g; they are rarely found for sale. Prized in Asia for its taste, stronger than a chicken egg’s; it must be boiled for at least 15 minutes to destroy harmful bacteria. The largest of all eggs, it can weigh up to 2 kg; one ostrich egg makes an omelette large enough to feed 10 people. Very popular in China and Japan, it is usually eaten hard-boiled, often as an appetizer; it also has decorative uses.